55424-WC is rated 3.7 out of 5 by 16. Experience a better shower with the control and flexibility of a Delta® hand shower. Great for showering yourself or your loved ones and pets, as well as for keeping your shower and tub clean. With three spray-selection buttons and a pause feature, ActivTouch hand showers allow you to choose from up to nine different spray settings with a simple, one-handed activation, delivering a new level of innovation for an enhanced handheld showering experience. While other products may gather unsightly mineral build-up over time, Delta soft rubber Touch-Clean® spray holes allow any mineral residue to simply be wiped away for an instantly refreshed look – with no need for soaking or the aid of chemical cleaners. The pause setting gives you ample space for shaving, lathering and other shower tasks, then easily restarts the water with the temperature where you left off. This spray setting helps you conserve water, so you can worry less about depleting your supply of hot water - and you help the environment too. 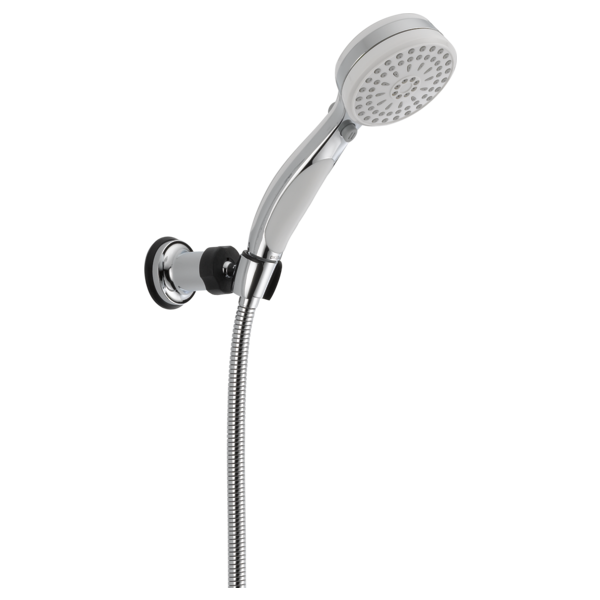 Rated 4 out of 5 by Jody from Good price, good function This shower head has beaten the pants off of 2 other very fancy expensive shower heads I have had in the past. The first one I bought for a rental house and just installed 2 more in my new construction home. Rated 2 out of 5 by SJM from It’s terrible, it has hardly any water pressure but the rest of my water source is fine. Rated 5 out of 5 by DMCV from Great product, easy to use no complaints - needed a handheld, this fit the bill perfectly. settings are great, adds nicely to our shower. Rated 5 out of 5 by lmo from Perfect hand held Easy to use, Great quality and looks perfect! Rated 3 out of 5 by ipser from Great features but unrelaible parts I bought two of these shower heads and they are excellent EXCEPT that twice now the back selection buttons have become stuck after a few weeks of use. The first time I exchanged the unit where I purchased it. Now it's happened to the second unit and I read that it has happened to others. I fear that there will be no end to this. Is there a way to get the buttons unstuck? Rated 1 out of 5 by Jayhawk from ActivTouch button not working. I bought this about 6 months ago. It was working great but then the ActivTouch button on the top stopped working. The spray remains the same. The button that pauses the flow works fine. I tried soaking the shower head in white vinegar to remove any calcium deposits as we are on a well but have a water softener. Any ideas to fix it? My last shower head lasted 15 years. Not happy. Rated 3 out of 5 by Ricky from Good wall holder. Weak Massage Bought this to replace an 8-year old delta massage wand. The old wall holder had broken internally and would not stay up, and the internal mechanism of the wand started making loud noise. This newer model is much lighter, easy to operate with push buttons instead of turning a stiff control ring, and provides a very full, gentle rinse spray. The pause button is helpful. However, the massage function is very weak, barely perceptible as a massage. Weird, given that both the old and new wand have the same GPM. The new style wall holder is much better, and uses an internal (replaceable) O-ring to provide support. I suspect it will last much longer. Is it possible to purchase the wall mount bracket for the 55424-WC separately? Is it possible to purchase the wall mount bracket for the 55424-WC separately? I recently installed a 54424-WC-PK and I find the resulting position of the hand shower unacceptable. Thank you for your question. Delta Faucet model # 55424-WC does not break down into separate parts for purchase. I need information regarding the wall mount bracket that comes with this unit. Is the wall mount bracket adjustable in that it moves the shower head down at a 45 degree angle? Or does this attach to a shower arm. I had no shower in my bathroom and just added a handheld shower using a diverter on the tub faucets. The old wall bracket held the shower head upright so that when turned on it shot across rather than down at the body. I want the new handheld shower to be able to adjust the angle of water flow down. Thank you for your question. Delta Faucet model # 55424-WC does have an adjustable wall mount that will allow you to angle the handshower down if you would like to do so. Is the wall mount shipped with this product U4005-PK? Does this product Have the longer hose and stretchable hose? Can this hand shower be used with cassidy tempassure system (t17T297-RB) and 6 function valve diverter (t11900-rb)? THanks! i am looking for a thermostatic valve to go along with this handheld. casn you suggest one? Thank you for your question. Delta Faucet model # 55424 can be paired with any of our 17T thermostatic series faucets. You will also need the R10000-UNBX rough-in, along with the R11000 diverter rough-in and the matching series trim. One last necessary peice is the 50560. If you are only using a handheld and not a tub/shower or shower only combination, then look for a series that has a valve only 17T model like the T17T097. Does it have an on/off switch on the shower head? I need it to bathe dogs so I want to be able to turn it on and off at the shower head. I like the ADA grab bar 56302, with its ADA slide mechanism, and it includes a hose. Also, I like the 55424 hand shower, to use with the ADA grab bar. Although the 55424 also includes a hose. How can I order the 56302 and 55424 together, and not pay for two hoses?